Have you got your own cat scrapbook layout we can enjoy? Do you love your cat as much as I do mine? You'll see my scrapbook homage to 'Bella' at the bottom of this page. I bet you've made a layout or two to show off your own cat, haven't you?! Well, I for one would love to see it - and I'm sure I'm not the only one. I'll include the best ones on this site for evermore - so you can send the page link to all your scrap friends. 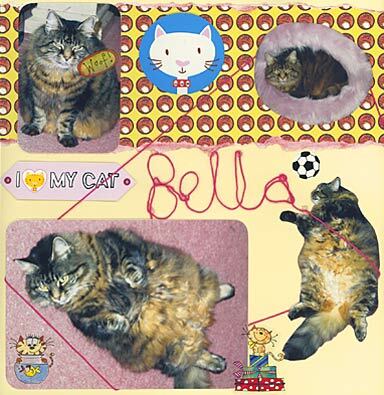 My cat scrapbook layout is dedicated to our lovely, tubby cat, Bella. She is totally devoted - to eating and sleeping - and we wouldn't have her any other way. She's eatin' everything in her paaath! The image on the bottom right suggests Bella plays soccer, could rise majestically above defenders, AND head a ball goalward. This would be misleading. However, you can make fun features on layouts by cutting out your photo subject's outline - rather than just cropping - and placing that image in any way you fancy. It's great with pets because they're guaranteed not to take offence. Since I made this cat scrapbook layout, and Bella's still thriving by the way, I have found a great tool for producing better looking layouts more quickly. It's Jen Gormley's excellent '500 Scrapbooking Sketches' which cuts out all the time I'd normally spend changing my mind about the layout half way through. Talking of 'half way', if you scroll down about half way down this page you'll see how Jen has created a fab layout from a simple line-drawn sketch template. I got the 'string idea' by watching Bella get caught up in a piece of string and then proceed to walk round two small items of furniture. It wasn't difficult to make the word 'Bella' (I was lucky with those letters perhaps!) and attach my string to the page with glue dots. Then it was a case of threading the string around my photos. Ah, c'mon! Both. Life's too short! The rub-ons are from Penny Black, their 'Stickeroo' range. (Sounds like a soccer team of thin Australians. Bella couldn't play for them). The stick-ons are from the 'Chester' range from Memory Big Ideas, except Bella's football which is by Stickapotamus. I needed mostly a plain cardstock so the threaded string would stand out, for which a cream stock from Papermania was fine. Couldn't resist the Dovecraft paper though, nor could I resist chalking the torn edges with 'All Night Media' chalk from Plaid, (the thing dead men usually don't wear).